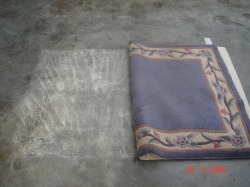 - Dry soils contribute to 75% of the total soil in carpet. - 16% of total soil are water or solvent soluble. - The remaining percentage constitutes "unidentified" soils. The most effective way to remove dry soils is by dry vacuuming. If the soil is dry, it is best to remove it dry. Solvent soluble soils are best dissolved and removed with dry solvents. Using general detergent followed by thorough rinsing, water soluble soils can be effectively dissolved and removed.